Looking for a Used Encore in your area? CarGurus has 41,120 nationwide Encore listings starting at $5,995. Not exactly known for innovation, Buick has nonetheless broken new ground with its downsized Encore subcompact crossover. For 2015, this urban warrior, now entering its third year of production, remains unique in both size and its quasi-luxury standard accoutrements. It also holds the dubious distinction of being a dog on the open road despite a turbocharged 4-cylinder powerplant. Anyhow, the upcoming year’s Encore lineup again includes the Base Encore, the up-featured Convenience, the penultimate Leather and the flagship Premium. Once more seating 5 folks and returning the traditional 48.4 cubic feet of cargo area (with the rear seats folded), this pint-size Buick won’t knock any hosiery off with its looks, its cramped rear-seat legroom or its tepid toting tally. However, the city-size Encore also won’t disappoint in either features or ride comfort, and in its (sort of) pugnacious profile and outsized wheels, might even be mistaken for its larger Enclave cousin. And don’t forget, though delivered with standard front-wheel drive (FWD), all 2015 Encore trims are available with full-time all-wheel drive (AWD) to help get you through snow-laden avenues and slush-covered parking spaces. Although it’s fundamentally unchanged for the upcoming model year, all 2015 iterations of Buick’s cuddly crossover will carry GM’s new 4G LTE data-connection technology integrated into the standard OnStar system to allow the creation of a mobile WiFi hotspot. And don’t worry—the standard IntelliLink infotainment system returns for the upcoming year’s iterations, bringing, of course, the 7-inch color touchscreen along with it. As mentioned, a distinct Achilles heel in Buick’s downtown-oriented cute-ute is again its decidedly un-peppy standard 1.4-liter turbocharged inline 4-cylinder (I4) powerplant. Putting out a mere 138 hp and 148 lb-ft of torque under the management of the returning 6-speed shiftable automatic transmission, this little-engine-that-almost-could is noted to be among the pokiest of an already pokey pack. So underwhelming is this little motor that a number of reviews caution patience in passing maneuvers and frequent use of hazard lights when taking this little hauler on the highway. Mileage with the turbocharged I4, meantime, is estimated at 25 mpg city/33 highway for FWD editions and 23/30 in AWD-equipped variants. One further downside noted by more than a few reviewers is the fact that the Encore's full-time AWD system does not perform nearly as well as other crossovers of the Encore’s admittedly limited ilk. Okay, back to the good stuff. All Encore trims come with 18-inch painted alloy wheels and a roof rack, as well as heated power-adjustable mirrors adorning their over-executed exteriors. Inside, look for, depending on the trim selected, vinyl/cloth or leather upholstery, heated power-adjustable front seats and a fold-flat front passenger seat that’ll allow a few extra cubes of cargo carrying capability. Cruise control and telescoping tilt-wheel steering also return for 2015, as do manual air conditioning in the Base Encore and dual-zone auto climate control in the Convenience and higher trims. A rear-view camera remains standard lineup-wide, as does Bluetooth-integrated OnStar voice-activated directions-and-communications technology, now with that new-for-2015 4G LTE capability. Selected higher trims also get such added goodies as remote engine start, an auto-dimming rear-view mirror, memory for driver's settings, a heated steering wheel, front and rear parking sensors, lane-departure warning and forward-collision alert sensors. Further techno-goodies endowing all trims include IntelliLink infotainment, with said infotainment system interfaced with the standard single-CD player, 6 speakers and satellite radio in lower trims, and it also complements the 7-speaker Bose sound system that graces the top-shelf Premium trim. Meantime, noteworthy options include upgraded 18-inch wheels, a power sunroof, roof-rack cross rails and GPS navigation. Finally, standard safety equipment adorning all 2015 Encore variations includes 4-wheel antilock brakes (ABS), traction and stability control, front and rear side-mounted and head-curtain airbags, daytime running lights, OnStar emergency communications and stolen vehicle tracking, a post-collision safety system and a remote antitheft alarm. The Convenience and higher trims additionally boast front fog/driving lights as standard safety equipment. 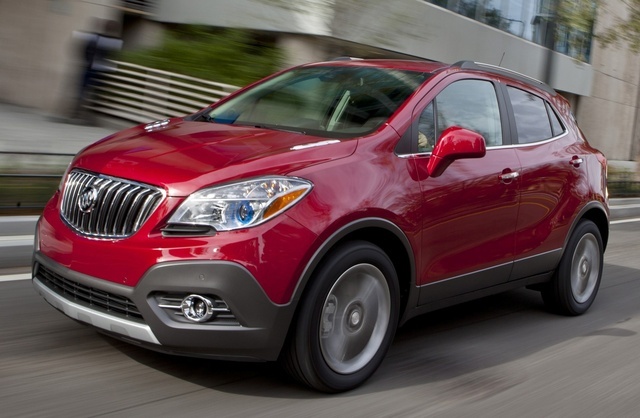 What's your take on the 2015 Buick Encore? Fourdoors I've had mine for 2 weeks now and I just love it. I don't know why reviewers say it's underpowered (and they say that about almost every vehicle in this class). To me it's a peppy little engine that is at home both running errands around town and on the highway. Most of all, it's QUIET, which is not true of most small SUVs. It also has a luxurious feel that I really appreciate. Fuel economy is better than I expected and it has all the bells and whistles anyone would want in the mid level trim. Backup camera, rear cross traffic alert and blond spot detection are great safety aids. The only things I wish it had are bush button start and a remote hatch release. I love the seat height and the ability to park in tight spots. All in all, a practical, fun, and luxurious vehicle for a great price. Patrick I totally agree with Fourdoors.. I've had my 2015 Encore for three weeks and I love it. The interior is beautifully designed and executed, it has a good sound system and it is a nice quiet ride. It's not a quarter mile dragster and wasn't meant to be fast, but I never have any trouble getting on the freeway or passing slower traffic. I've put 1400 miles on it in three weeks, so yeah, I love this car. My first road trip was a little over 200 miles. I filled the tank and was on the freeway most of the time. At 189 miles I filled it up again, it took 5.01 gallons. Small engines have their place, and this one if working just fine for me, this car gets better mileage than my Honda Goldwing and I stay dry in the rain.. LOVE the Encore! Users ranked 2015 Buick Encore against other cars which they drove/owned. Each ranking was based on 9 categories. Here is the summary of top rankings. 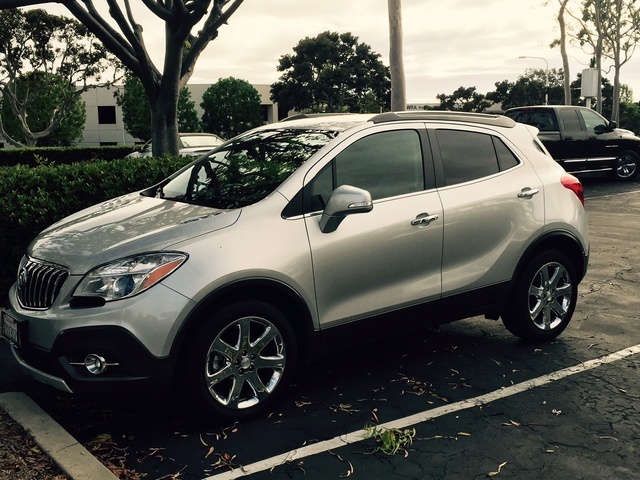 Have you driven a 2015 Buick Encore? "All Wheel Drive Is Off" Light Is On?